There are different types of noise. The noise most commonly associated with electromagnetic pickups is electromagnetic interference: that nasty 60Hz hum (or 50Hz, depending on where you are) and all its harmonics. High impedance pickups are plagued by electromagnetic interference, necessitating the invention of the humbucker in the 50s. 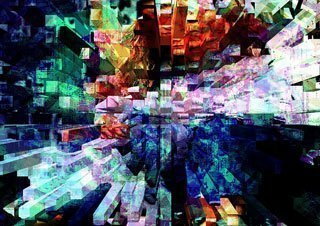 Somewhat related, another type of noise is electrostatic noise. While electromagnetic noise interferes with the signal inductively, through the coils, electrostatic noise couples capacitively into the signal from e.g. the power lines, by means of the surrounding air and our body. Electrostatic noise can be blocked using proper shielding, and more effectively by using balanced wiring or balanced preamplifiers. The Nu pickups are virtually immune to both electromagnetic and electrostatic noise. The low impedance coils are significantly less susceptible to electromagnetic interference. High impedance humbuckers are far from perfect! To get good noise cancellation, you need to have good matching of the coils and that is very difficult to achieve. What I am particularly concerned about is thermal noise (or Johnson noise) generated by the random thermal motion of charge carriers inside an electrical conductor. This noise is unavoidable and is heard as hiss. Thermal noise is directly proportional to the resistance of a conductor. A 1kΩ resistor starts off with a 1 nV/√Hz noise and all amplifiers have some thermal noise from such components (the resistors and semiconductors). What’s more concerning is that the Nu sits right in front of a possibly long chain of effects with potentially extremely high gain provided by tube preamplifiers, compressors, distortion and overdrives. Starting with the preamplifier gain needed to boost the low-level signals of low-impedance coils, in addition to all the combined gain stages in the signal path, you end up with a gain from 22 (27dB) minimum clean, to 200 (46dB), and beyond for extremely high heavy-metal gains. And it does not stop there! One way or another, you will also have to mix the channels. Each channel will add its own noise to the mix. So we strive for perfection. Below are some graphs that show the inherent noise of various passive and active pickups, vis-à-vis the Nu version 1 and version 2 pickups. For our baseline, we start off with the system noise. 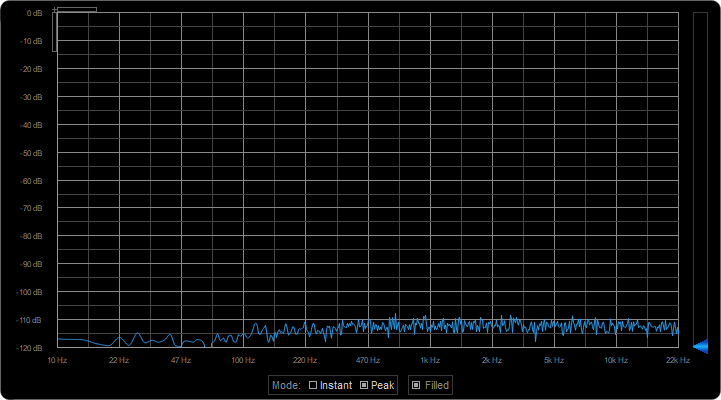 For calibration, we use a 1v peak-to-peak sine wave set at -10dB. To test the system noise, the input is simply shorted to ground. For all the graphs below, we add a constant 40dB gain (x100), using a post-amplifier, to bring the noise level upward to a level we can detect. Take note that in all the tests, we isolate the pickups in a well-shielded enclosure. The graph below is from the Les Paul humbucker pickup. It is a lot better than the Stratocaster of course, but still very far from perfect. The noise is still very present. 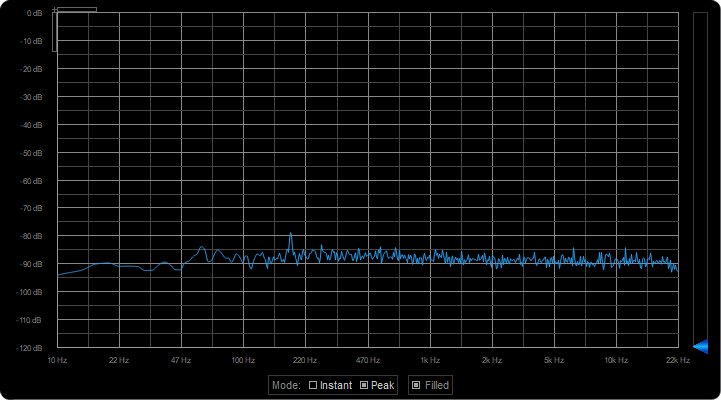 For this one, we measure the EMG81 noise. EMG81s are medium impedance, active pickups with an integrated balanced preamplifier. EMG81s are also humbucking double coils. Already you can see vast improvements. But are they noise free? No, they are not! But notice the noise floor. 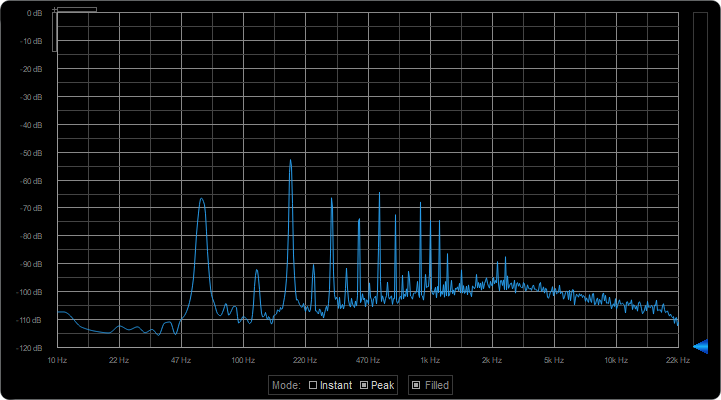 Try to draw a line through the lowest level wiggles in the graph; that’s the noise floor. That is the hiss! Compared to passive pickups, active pickups have a higher noise floor that you normally do not notice because electromagnetic noise is still very dominant. The Nu version 1 utilizes the Toshiba 2SC3324 ultra low-noise NPN transistor with an exceptional noise figure of 0.2dB (typical) in a simple, single-ended, common-emitter configuration. The Nu’s preamplifier is required to have higher gain, compared to EMGs. 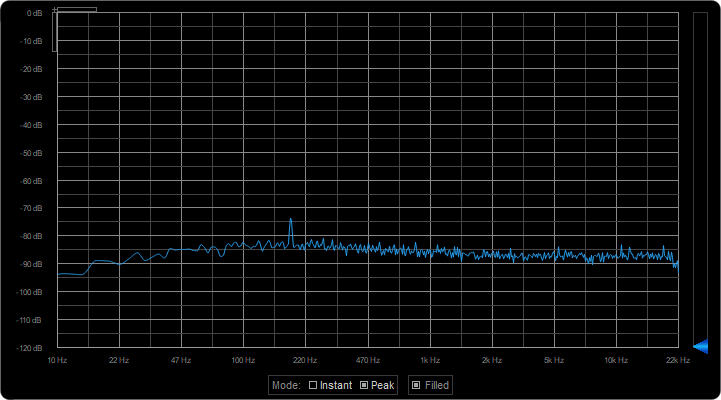 We need to amplify the weaker signal, from the low-impedance coil, a lot more to get it to instrument level. The EMG81 preamplifier has a gain of 5 while the Nu preamplifier has a gain of 22. The bar is significantly higher for the Nu due to this higher gain requirement. 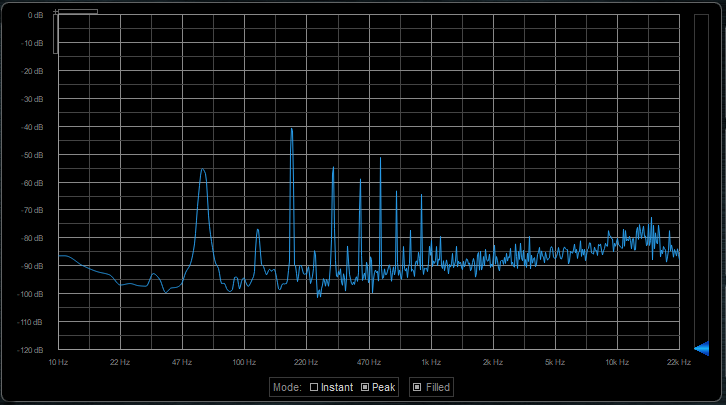 Here’s the graph for the Nu v1. 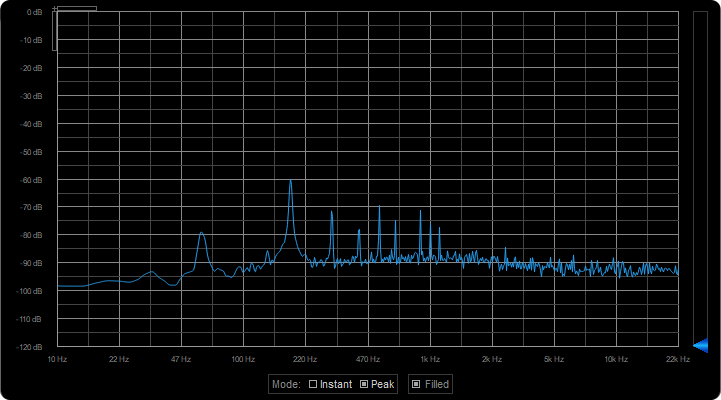 Notice that there’s virtually no hum (60 Hz and harmonics), except for that small bump at around 180Hz. The noise floor (net thermal noise) is about the same as that of the EMG. Now how about Nu v2? The Nu v2 has additional complexity with the discrete differential amplifier (front-end) for improved electrostatic noise immunity and another Op Amp differential amplifier driver (buffer) for expanded power supply range (up to 18v), better output drive and Rail-to-Rail output for optimal dynamic range. This additional complexity comes at a cost. The differential amplifier front-end itself has an additional (inherent) 6dB thermal noise because of the amplifier pair (two Toshiba 2SC3324 transistors). Is it worth it? Engineering is always a balancing act and in my opinion, the answer is YES. 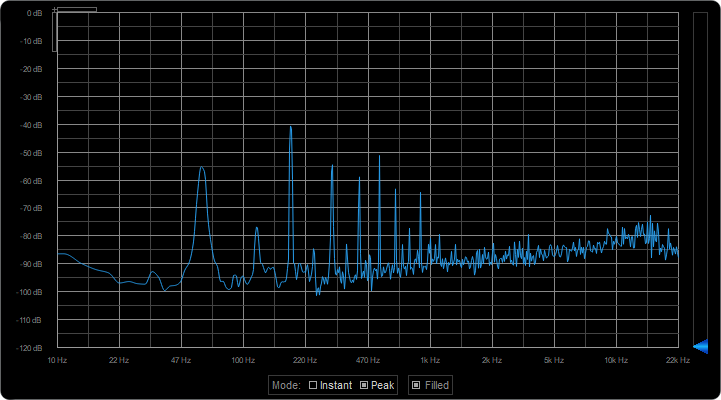 What’s important is that this noise floor is still way below the hum level of the EMG and the passive humbuckers. As soon as you get acquainted with the hum-free Nu pickups, you might be tempted to push the gain a lot more. But by doing so, you will end up amplifying the hiss as well, upwards to potentially uncomfortable levels. This hiss will be more evident because we are dealing with multiple channels, and as the number of channels increases, so does the hiss. And this hiss can be annoying. For optimum results, when dealing with extremely high gain, it is best to add a very mild noise gate or better yet, a downward expander for each channel set at a low threshold. Such a noise gate or downward expander can also minimize cross talk by preventing low level signals from bleeding through adjacent channels.